It wouldn’t have mattered. My friend and I had read so many glowing reviews about the city we were determined to visit, even though we only had a weekend and had already booked our hotel in Myrtle Beach ­ a two-hour drive away. Our Belgian draft horse “Tom” leads the way passed pastel-coloured mansions with elaborate wrought iron gates on streets lined with stately live oak trees. Here, gas lamps are lit 24/7, which Rosling says, gives the city a beautiful ambiance at night. I inhale the scent of jasmine flowers filling the spring air. 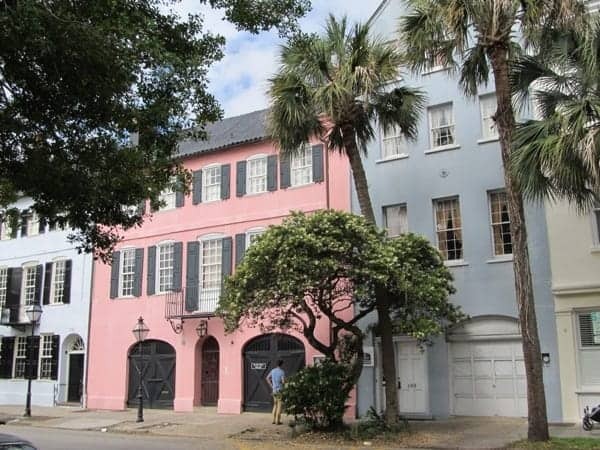 It’s hard to imagine Charleston has not always been a picture of beauty and tranquility. The city has survived wars (the Civil War started here), several great fires, earthquakes and hurricanes. Through it all, it has managed to become one of the top travel destinations in the U.S.
One of the worst disasters was the big earthquake of 1886, which damaged 2,000 buildings, though it didn’t destroy the Old Powder Magazine ­ South Carolina’s oldest public building which also happens to have three-foot-thick walls, or the Old Exchange and Provost Dungeon, considered one of the most historically significant colonial buildings in the U.S.
Today you can see earthquake bolts (some of which resemble circular discs) on the outside of many historic homes. The bolts are caps for long iron rods, which run through the interior floors and are cranked regularly to straighten walls and correct other structural damage. There is history at every turn ­ a graveyard on Meeting Street with headstones dating to the 1690s; the old jail, which resembles a castle, and is said to be the most haunted building in Charleston; and the Old Slave Mart Museum, located in a building where slaves were once bought and sold (forty percent of all slaves that came to the U.S. came through Charleston). 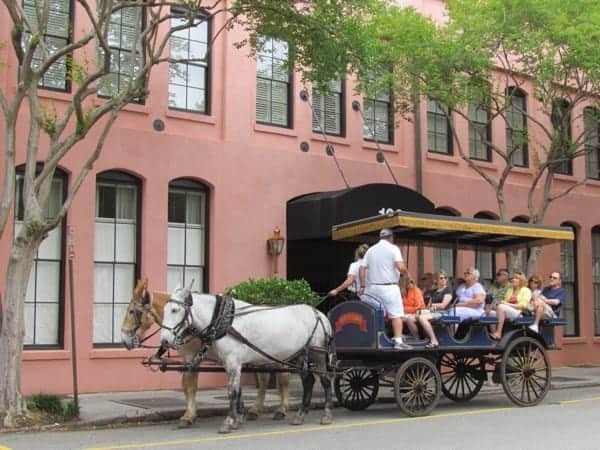 “If there’s one thing you should learn on this tour it’s that during the Civil War, Charleston was bombed by the north for 578 days straight,” said Rosling, as we pass Chalmers Street, the city’s longest cobblestone street. Volunteer holidays: who do they really benefit? [vc_row][vc_column][vc_single_image image=”10115″ img_size=”full” alignment=”center”][vc_empty_space][vc_column_text]BY ERIN GOUWELEEUW – Many of us volunteer to help our communities, our environment, wildlife, or myriad other causes. Whatever we choose, the experience of donating one’s own time to help someone or something can be incredibly rewarding. A natural extension of this is to want to give back and “make a difference” while on vacation – and the popularity of volunteer holidays is proof of that desire. Unfortunately, volunteer holidays have developed a distinctly spotty reputation, thanks to people more interested in making money than in helping. Orphanages in particular seem to be a target, and there are many reports of children being taken from their parents under guise of opportunity for a better life – only to end up being forced to entertain tourists and suffer abuse1. In fact, a UNICEF report from 2011 described studies from both Brazil and Sri Lanka where over 50% of families place their children into residential programs (orphanages) because of poverty – but that most would choose to keep their children at home if the family was given community care instead2. The fact that the volunteer tourism sector remains unregulated – and gaining in popularity – leaves a large gap for people to establish lucrative businesses based on the exploitation of children, animals and communities. Well-intentioned volunteers have no simple way of comparing the veracity of these businesses, and can easily fall victim to opportunistic marketing ploys targeting their emotions. A common approach uses the volunteer experience itself (i.e., the fun of playing soccer with kids or helping animals, or teaching in a local school), which sets the stage for phony orphanages and run-down zoos to be passed off as animal sanctuaries3. In a recent interview, David Clemmon, Founder of VolunTourism.org, explained that the regular market forces – those that usually dictate which companies (or NGOs) remain in business – haven’t yet influenced the volunteer industry. He attributes at least part of the problem to volunteers not speaking up about program disappointments, failures and unethical practices. But if we accept that normal market forces are not acting quickly enough on this growing (but still disparate) industry, the question should be asked: How can a consumer be expected to differentiate the good from the bad? One way is to put international standards in place – and although this seems like an impossible task, there are currently two noteworthy international initiatives working towards the goal of developing comparable industry certifications worldwide. The Global Sustainable Tourism Council (GSTC) (http://www.gstcouncil.org/) is dedicated to establishing and managing standards for sustainable tourism – both for destinations and the companies that serve them (tour operators, airlines, cruise companies, etc.). And, interestingly – a governing body has become deeply involved: France has established Acting for Responsible Tourism (ATR) (http://www.tourisme-responsable.org) to establish an international tourism certification to ensure transparency in both intent and quality of service. Although these initiatives target the tourism industry as a whole, so-called “voluntourism” falls under the same umbrella and will therefore reap the ethical rewards of industry standards. In the meantime, while the GSTC and ATR work towards the development of industry standards, there are some excellent resources and awareness initiatives, such as Friends-International’s Children Are Not Tourist Attractions campaign (http://www.thinkchildsafe.org/thinkbeforevisiting/), which demonstrates the scary reality that many children face in residential care programs. Friends-International attacks the issue by spreading awareness of how people are lured into these traps and how to avoid them. While there is no replacement for careful and considered research (see some great tips here), consumers do have some easier options. One terrific way to ensure your time and effort are well spent is to travel with a well-known company that has developed a way to give back on their own. Our favourite is Intrepid Travel; this Australian company funds the administration of The Intrepid Foundation, which works with non-government organizations to tackle issues such as child welfare, education, the environment, human rights and sustainability (http://www.intrepidtravel.com/about-intrepid/intrepid-foundation). As consistent leaders in this arena, Intrepid Travel have ensured their processes are fully audited and transparent; an absolutely enormous, organization-wide initiative – demonstrating their dedication to responsible travel. There are also other companies with not-for-profit organizations; TravCorp (the parent company of well-known brands such as Trafalgar, Contiki, Insight and Uniworld) has the well-funded and managed TreadRight Foundation (http://www.treadright.org) and G Adventures has a foundation called Planeterra (http://www.planeterra.org. Similarly, smaller companies such as Operation Groundswell (http://operationgroundswell.com) have recognized the need for more “ethical travel” options – and have aligned themselves with local NGOs to this end. But, the dilemma still remains: despite the many online review forums and volunteer directories, there is no one resource available for consumers to reference – and no governing body to audit false practices in the volunteer travel “industry”. Our advice is to do as much research as possible – because with the right knowledge you can contribute to great projects around the world. Read moreVolunteer holidays: who do they really benefit?